The procedure normally followed on occasions like this was adopted, that is to say, men were posted in various positions to act as a covering off party and we went along to the public-house where we hoped to find Ryan. The two of us entered the public-house by a door on the right hand side, called for two drinks, and proceeded to talk in general terms about nothing in particular, while at the same time giving the customers the once over.We eliminated the different people in the shop with the exception of one man who was sitting on our immediate right deeply immersed in a study of The Early Bird, a racing paper. Edward J Byrne was born in 1900 in New York though his parents returned to Ireland very soon after his birth, he died “sudden” on 14 Jan 1922 in Boydke, County Clare. 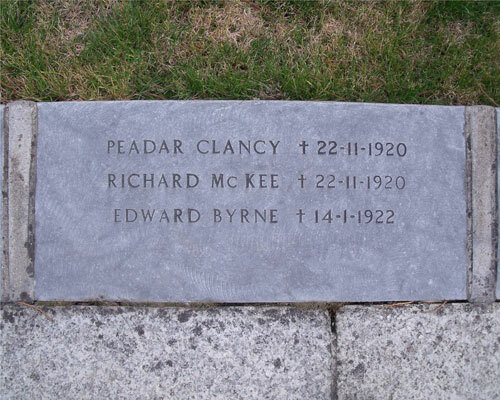 He is buried in the Republican Plot in Glasnevin Cemetery (shares burial plot with Peadar Clancy & Richard McKee shot Bloody Sunday – 21 Nov 1920). “Amid many manifestations of sorrow, the funeral took place yesterday to Glasnevin Cemetery of Lieut. Edward Byrne (21), of the Guards Company of the IRA, Dublin. Deceased who was a late member of “B” Company, 2nd Battalion, Dublin Brigade, belonged to Bodyke, Co. Clare where his death took place. As a soldier he had a remarkably record for bravery and good service. At age of 15 he fought in the GPO and was one of the reargaurd leaving with The O’Rahilly when the later was killed. During the late war he again saw service in Dublin and took part in the capture of the armoured car and the subsequent attempt to enter Mountjoy Prision. The late Lieut. Byrne was also one of the party who carried out the firing of the Custom House, escaping from it with Sean Doyle, his wounded comrade”. “When the grave had been closed and the last prayers recited a party of volunteers in uniform advanced and fired three volleys over the remains. The last post was sounded and the the detachment of volunteers then marched past paying the last military tribute to the deceased fellow soldier and officer.